» no.5 Was it some golden star? Somm Recordings is delighted to present a revelatory collection of orchestral songs by Sir Edward Elgar performed by two of today�s most exciting young singers � mezzo-soprano Kathryn Rudge and baritone Henk Neven � accompanied by the BBC Concert Orchestra conducted by Barry Wordsworth. The Hills of Dreamland takes its title from a line in Elgar�s well-known setting, beautifully still and beseeching, of Arthur L Salmon�s Pleading. Historically the least regarded part of Elgar�s output, his songs contain a treasure-trove of vocal gems and here receive performances of insight, imagination and emotional directness. The Op.59 Song Cycle is an exemplary case in point, by turns quietly radiant, touchingly nostalgic and achingly melancholic. Two settings of poems by Elgar�s wife � the richly orchestrated The Wind at Dawn and celebratory The King�s Way (which borrows a tune from his Fourth Pomp and Circumstance March) � show Elgar at his most evocative and ebullient. Sombre and powerful, The Pipes of Pan boasts colourful imagery and driving rhythmic energy, The River and The Torch wholly Elgarian in their wonderful sonorities. A first recording of the orchestral version of the marching song Follow the Colours shows Elgar at his most patriotic. The complete incidental music for a 1901 staging of WB Yeats� Grania and Diarmid offers a rare opportunity to experience the full gamut of Elgar�s moving and dramatic evocation of a timeless tale of love in the ancient Irish myth. A Bonus Disc of recordings made under the auspices of the Elgar Society showcases soprano Nathalie de Montmollin and pianist Barry Collett in a collection of piano-accompanied songs. It includes first recordings of the piano version of �Winter� from The Mill Wheel (with its churning left-hand patterns and a text by the composer�s wife) and the world-weary tread of Muleteer�s Serenade, setting words from Cervantes� Don Quixote. Song Cycle op.59 - Was it some golden star? Lovers of Elgar�s music have good reason to be thankful to the Somm label for a string of releases in recent years, ranging from rarities to some exceptional restorations of recordings by the composer himself. Now comes another fascinating addition to the series, this time featuring orchestral songs plus the incidental music to the George Moore/W.B. Yeats collaboration Grania and Diarmid (1901). Most of this repertoire has been recorded before, notably by the formidable Roderick Williams with the BBC Symphony Orchestra under Andrew Davis on Chandos, coupled with Elgar�s �symphonic study�, Falstaff. But although this new disc lacks that generous coupling, the BBC Concert Orchestra under Barry Wordsworth steal a march on their colleagues at the BBCSO in two important respects. Firstly, the orchestral songs are shared between two excellent young singers, mezzo-soprano Kathryn Rudge and baritone Henk Neven, both in lustrous voice, thereby offering timbral and registral variety to this under-appreciated corner of Elgar�s output. Neven�s voice has a grainy, youthful nobility to it which perfectly suits this repertoire, his enunciation is immaculate, and he gives memorable accounts of the three Op.59 songs of 1909 (a planned further three were never written, which explains the songs� strange numbering). He really enters into the spirit of the darkly-hued The Pipes of Pan (1900-01), and even the gratingly jingoistic Follow the Colours, a 1908 Empire Day song orchestrated in 1914, receiving its first recording here, benefits from his wholehearted commitment. Kathryn Rudge�s focused but full-bodied mezzo brings clarity and power to a superbly atmospheric account of The Wind at Dawn (1888, orchestrated in 1912), and the two Op.10 songs (The Torch and The River, both settings of Elgar�s own stylised verses) are just as memorable. Her rendition of Pleading, composed in 1908 and probably orchestrated as a purely instrumental miniature, is supremely sensitive and as good an argument as you�ll ever hear for its performance with voice. It takes quite something to rescue the absurd adaptation of the fourth Pomp and Circumstance March to Alice Elgar�s doggerel marking the opening of The Kingsway in central London, but Rudge � with the sterling support of the BBC Concert Orchestra which distinguishes the whole disc � somehow manages it, and those who respond to this sort of heart-on-sleeve patriotism will no doubt enjoy it hugely. 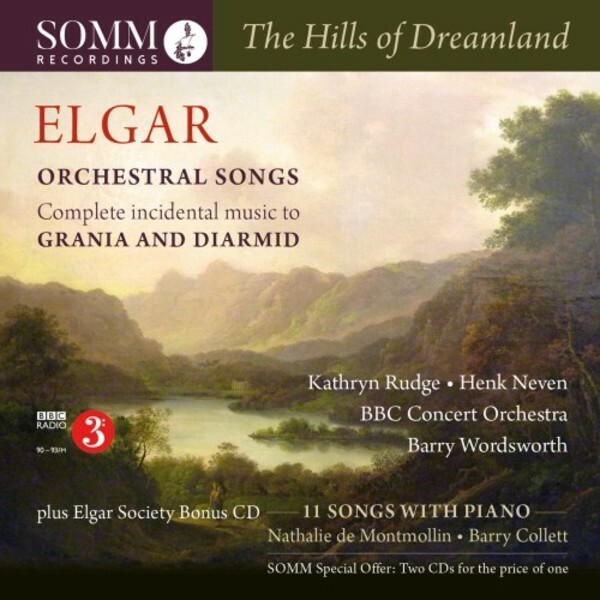 Wordsworth and the orchestra come into their own in the Grania and Diarmid music, bringing an almost Sibelius-like evocation of nature and ancient times to the Incidental Music and Funeral March, and then accompanying Kathryn Rudge matchlessly in the mysterious song �There are seven that pull the thread� (an item not included on the rival Chandos disc, and well worth hearing in its own right). This whole disc, brilliantly sung and with exceptionally vivid and splendidly balanced accompaniments to which every section of the orchestra contributes, is enormously engaging from start to finish, and a worthy rival to the BBCSO/Davis disc. What makes it even more attractive, however, is the generous addition of a bonus featuring soprano Nathalie de Montmollin accompanied by Barry Collett in a selection of Elgar�s songs for voice and piano. They include such miniature gems as Like to the Damask Rose and Queen Mary�s Song, as well as the chivalric ballad As I laye a-thynkynge, and the original piano versions of The Torch and The River, making for fascinating comparisons with their orchestral versions on disc 1. De Montmollin brings a gentle radiance to these glimpses of Elgar in more intimate mood, and Collett negotiates the often awkward accompaniments with unassuming panache and musical intelligence. Notable inclusions are two further premiere recordings, the Mill Wheel song Winter by the future Alice Elgar, and the Cervantes setting Muleteer�s Serenade, both of which were unpublished and reused in Elgar�s cantata King Olaf, but now lovingly restored to their original form by John Norris. Like so many of Somm�s previous Elgar releases, this generous collection of songs (two discs priced as one) is essential listening for Elgarians everywhere, enhanced by excellent recordings (the piano songs performed live at Southampton�s Turner Sims Concert Hall), and fine notes from Barry Collett and fellow Elgar expert Andrew Neill. An outstanding addition to the catalogue.